Luis Suarez has urged Barcelona's fans to keep faith with the team despite back-to-back La Liga defeats in his first two appearances. Barcelona followed their 3-1 defeat by Real Madrid with a shock 1-0 home loss to Celta Vigo on Saturday. The Catalan club slipped from first to fourth in the table, two points behind leaders Real. 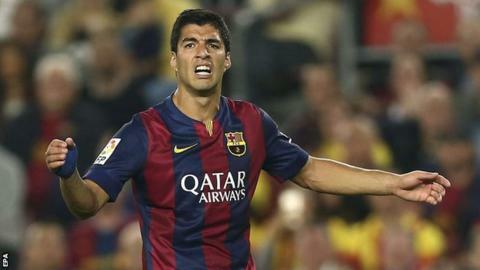 Striker Suarez, 27, said: "Stay with us, because we are the first ones who want to turn this around." Uruguay international Suarez, who joined Barca from Liverpool for £75m, has recently returned from a serving a four-month suspension for biting Italy's Giorgio Chiellini during the World Cup. But his introduction into the Barca first XI has coincided with a slump in form by a team that had won seven and drawn one of their first eight league matches. Suarez, making his home debut against Celta, had two chances to score an equaliser but missed with a header and had an effort saved by goalkeeper Sergio Alvarez. His fellow forwards Neymar and Lionel Messi each hit the woodwork twice. "Sometimes football is just unfair," Suarez said. "When the ball doesn't want to go in, it doesn't go in. "We didn't have the necessary luck against Celta but we need to keep believing in ourselves. We want to turn this around and win titles because we are the best team in the world." It was Barcelona's first loss at home in the league since February and the first time they had failed to score in a home La Liga game in three years. "We had a poor game and we were not sharp," said defender Javier Mascherano. "Along with the fact we were unable to create chances we were not able to show our football and that is worrying. "Still the season is long and you can't be at your best all the time. We know that there are people as well who want to make out the team is worse than it actually is." Barcelona next's challenge is a Champions League Group F away game against Ajax, the club where Suarez made his name. Suarez scored 111 goals in 159 games for the Dutch club between 2007 to 2010.